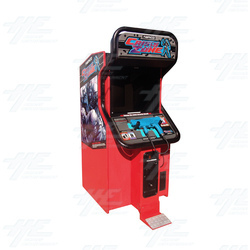 Crisis Zone is a spin-off of the Time Crisis arcade shooter franchise. The focus of Crisis Zone is to suppress a rogue terrorist group that has seized Garland Square outside of London. You play as Claude McGarren, an elite Anti-Terrorist trooper and part of the Special Tactical Force (STF). Players can choose their route from the beginning of the game between three stages. Once the player has completed a stage they will then advance into one of the other three zones, and once all stages are complete, they will advance to a special stage engaging the final boss. Crisis Zone also judges the players performance and vamps up the difficulty based on how the player performs in each stage. The game uses the same pedal system as the Time Crisis games to reload and hide. In Crisis Zone, the player uses a newly designed machine gun controller - a customized Steyr Mannlicher TMP with Laser Aiming Sight and a capacity of 40 rounds. Like the Time Crisis series, the action pedal is heavily used. Players can shoot and hide, including the ability to take cover behind a portable riot shield that is strapped to the character's left arm. The game uses the same pedal system as the Time Crisis games to reload and hide. In Crisis Zone, the player uses a newly designed machine gun controller - a customized Steyr Mannlicher TMP with Laser Aiming Sight and a capacity of 40 rounds. Like the Time Crisis series, the action pedal is heavily used. Players can shoot and hide, including the ability to take cover behind a portable riot shield that is strapped to the character's left arm.